These are 3 inches wide. These foam applicators are awesome and recommended by General Finishes to use with their products. 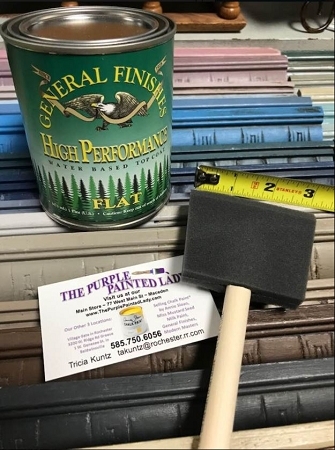 According to Nicki, one of our customers, she wrote us, "I sealed the piece with three coats of General Finishes High Performance Top Coat using a foam brush. I like using a foam brush because there are literally NO brush stokes!!!" We have these priced very inexpensively, so never reuse a foam brush. Also note- not all foam brushes are made the same. Make sure to get a good one so it does not crumble away during your project.